Make your way into a cascade of clean water with the Midea 12L Table Top Water Dispenser MYR720T. With whatever water needs you might have, you can trust Midea to take care of it for you. In seconds, you'll be able to cozy up with a hot choco on your hand just by taking water from the pink tap. If you want normal water, place your glass under the blue tap. The Midea 12L Table Top Water Dispenser MYR720T boasts 12 liters of capacity to accommodate your needs all day with an overflowing supply of water. It comes in a convenient table top dispenser design that you can easily find a spot for in your home or office. With a quiet operation that comes with its energy-saving technology, surely this wonder unit from Midea is a winner. Finding home appliances that fit your home or office space is never a hard task when you have Midea on your side. 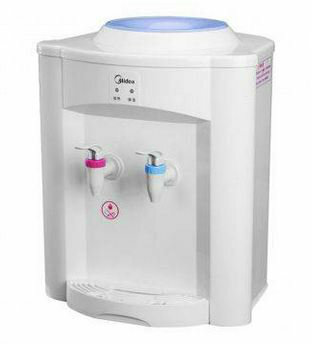 The Midea 12L Table Top Water Dispenser MYR720T is a gentle machine that cares for you and your family too. Its hot water faucet comes with safety lock to prevent children from scalding. Midea endeavors to provide household appliances with the best cost-for-performance ratio to consumers. They make every effort to create a better quality of life for people: creating a top-grade home environment and quality experience, with with their people-oriented products and sincere approach.